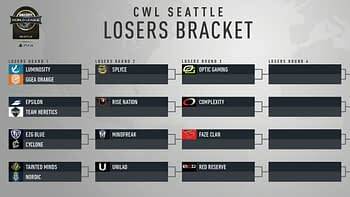 Day Two of the Call of Duty World League Seattle tournament held quite a few upsets, much like Day One did. Quite a few of the non-Pro League teams hung onto the competition long enough to take out some of the major pro teams. Open Winners FaZe Clan were shunted off to the losers bracket after going 3-2 against Lightning Pandas. However, their round had already been called in the Pandas favor, which, naturally did not go well with some of FC. Additionally, Ghost Gaming took out Team Kailber in a pretty large upset at the end of the night, moving Kaliber down to the losers bracket. Honestly, the whole tournament has been one mess of unpredictability. Friday was filled with tons of upsets, and Saturday was no better. Earlier in the day Lightning Pandas took the top spot in Pool A, despite heavy competition in the pool. Enigma6 were the top team of Pool C with eUnited shortly behind after E6 went on a crazy winning streak. Team Envy remained undefeated for much of Friday and Saturday, taking the top spot in Pool B, while Ghost Gaming knocked OpTic Gaming off the brackets to take second place in that pool. Team Kaliber grabbed the top spot in Pool D after a tense tiebreaker against Evil Geniuses. And then there were the final matches of the evening. eUnited took out Lightning Pandas to advance to the semi-finals, Ghost Gaming won against Team Kaliber, while Echo Fox took out Enigma6 and Evil Geniuses won against Team EnVyUs. 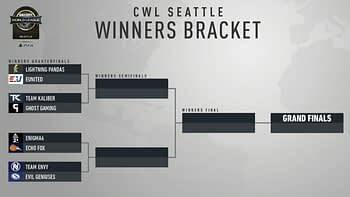 So tomorrow’s semi-final round for the Winner’s bracket will see eUnited go up against Ghost Gaming, while Echo Fox take on Evil Geniuses. 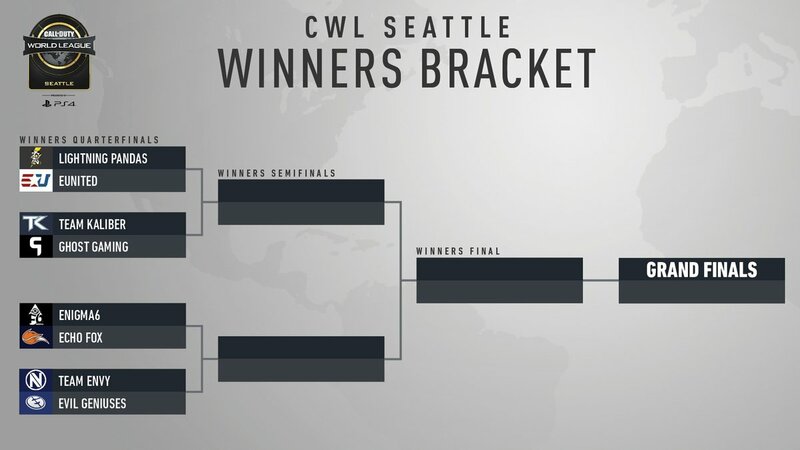 Meanwhile, the losers bracket had quite an interesting run. 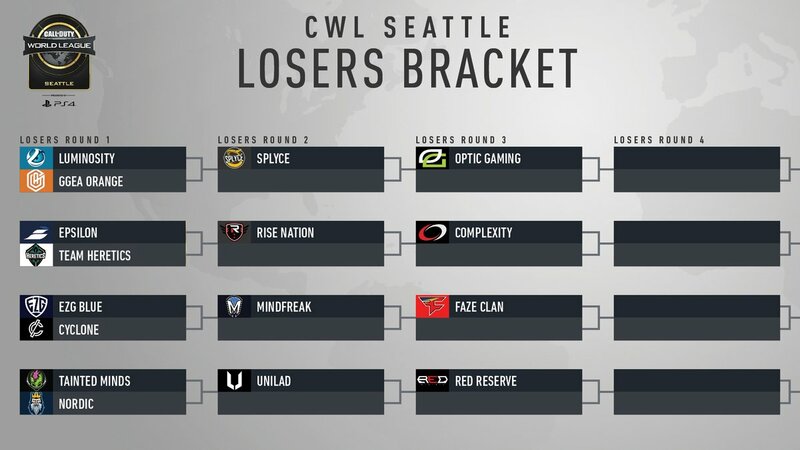 The losers bracket was stacked tonight with Lightning Pandas, Luminosity, Rise Nation, Enigma6, FaZe Clan, and Red Reserve all going on to battle it out in Round 4 of the Losers Bracket tomorrow morning. 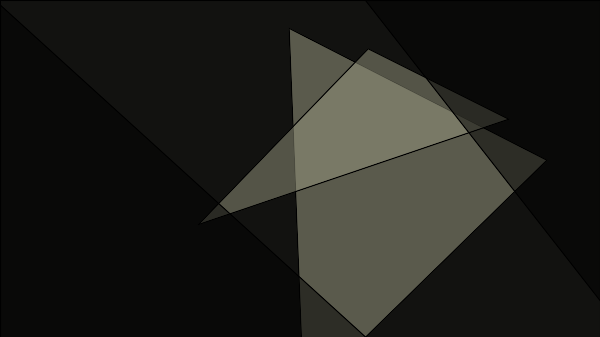 The broadcast begins again tomorrow at 1pm PDT. 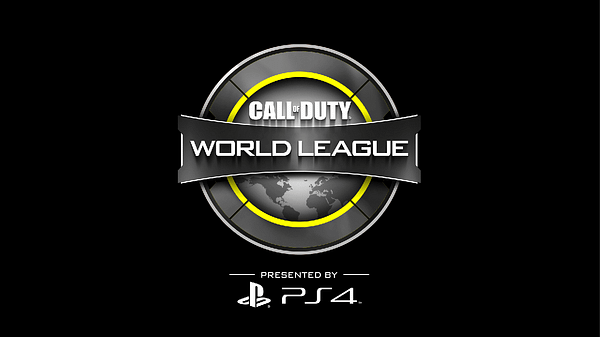 You can watch it over on MLG or Twitch.